WASHINGTON – U.S. Senator John Boozman (R-AR) took to the Senate floor this morning to express frustration over the inexcusable targeting of conservative groups by the Internal Revenue Service (IRS) and called on the administration to work with Congress to hold those responsible for the abuses accountable. “This scandal gives the already-maligned IRS a black eye. It reinforces people’s worst fears about Washington—that those in power will use any means necessary to maintain that power,” Boozman said in his speech. 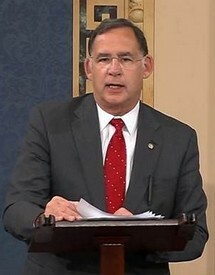 Boozman’s speech came as the Oversight and Government Affairs Committee in the House of Representatives began a hearing where Lois Lerner, the IRS official who first admitted to these abuses, invoked her Fifth Amendment right not to incriminate herself, continuing to hinder Congress’s investigation into the scandal. will be consequences for those who carried out these unjust actions. Senator Boozman delivered this speech on the Senate floor about this scandal and how the agency must be accountable. “Somebody has to be accountable. This is not a time for excuses. It is a time for leadership,” Boozman said. Tags: U.S. Senator, John Boozman, calls for accountability, IRS abuses, Arkansas To share or post to your site, click on "Post Link". Please mention / link to the ARRA News Service. Thanks! I would make them accountable. I would push and pass the Fairtax and eliminate the IRS and by doing so dismantle Obamacare. No income tax, NO IRS and no more hammer hanging over our heads anymore for daring to be productive making money! Compelled debt is compelled labor. Compelled labor is slavery. The government running up debts that they then saddle us with, is slavery.